My journey in Kutch began at the bus station in Bhuj. 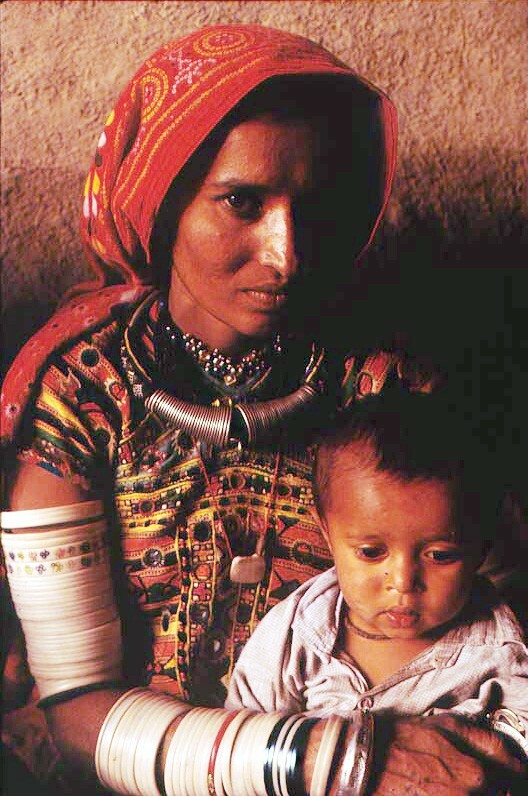 It is in a sense a microcosm of the whole of Kutch. The barren land is echoed in the drab bus depot, and in contrast to the plain settings are the people who dazzle the beholder with their brilliance. After the first few moments, my eyes grew accustomed to the sheer intensity of colour, and I perceived that here was more than a flock of exotically plumaged birds of paradise. I was amidst a people whose way of life and mode of dress had scarcely changed over centuries. A people whose identity means more to them than keeping up with the times. Indeed, there were differences in the attire of the women in each group at the bus station, ranging from subtle variations in each style of embroidery to quite dramatic distinctions. However, each woman, whatever her age, whatever the colour of her dress—be it vibrant red or dramatic black—wore her clothes with a certain assurance. An assurance that stems from the knowledge that her clothes are her identity. And central to their identity is their caste. It is their caste that determines in which village they live, which occupation they pursue and how they dress. Equally striking were the men, with their turbans and kohl-rimmed eyes. There was something about the look in their dark eyes and the set of their heads that suggested an indomitable spirit and fierce pride that had not been weathered down by life in the desert. This quality was all the more apparent as it is not encountered frequently in city dwellers. In the stampede for the bus bound for Dhordo, in Banni, I secured myself a place. Perched precariously on a heap of sacks in the aisle, between a goat and a milkcan, I wondered about my host. Gulbeg Hussain was an acquaintance of an acquaintance—was that too tenuous a link? Meanwhile our bus ploughed on in a cloud of dust. We were very far from a tarred road—we traversed a sea of sand with nothing to break the monotony except some babul scrub. After three hours we reached a few mud huts fenced in by thornbush. This was Dhordo. The dust had rendered the entire spectacle a drab shade of dun, giving it the appearance of an outcrop that had resulted from the forces of nature. I was met by my host, Gulbeg and an army of shrieking children and was assured that I was most welcome to stay as long as I wished. Gulbeg plays host to scores of visitors from all over the world. A proudly displayed visitors’ book revealed that most of those who enjoyed Gulbeg’s hospitality were total strangers. 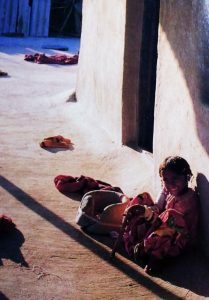 Life in the village, however, is not affected by visitors from the outside world. 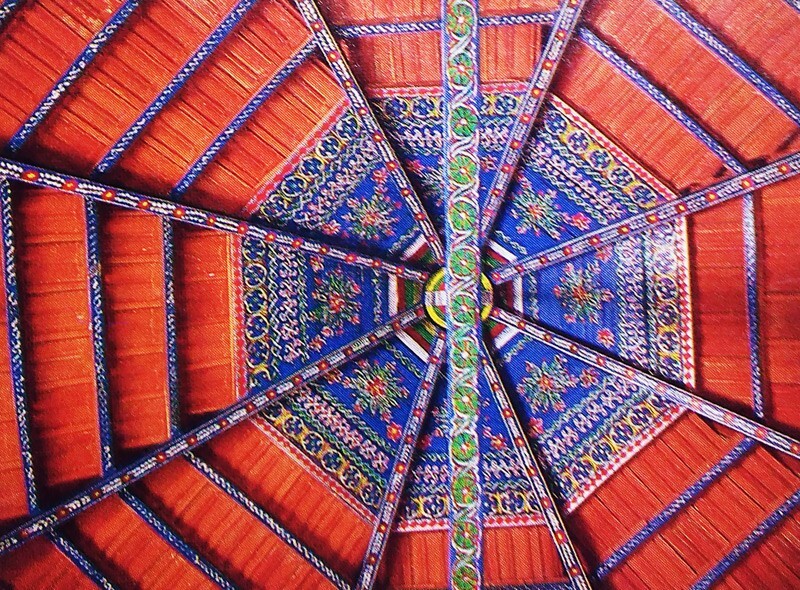 Mud huts are constructed as they always have been—round walls with conical roofs. These huts are clustered together as if for comfort and reassurance against the awesome forces of nature. Their construction is revealing—narrow doors and tiny windows seal off the external world effectively, while the thick walls keep the interior cool during blazing hot days and warm during chilly nights. As if to set off the contrast between the exterior and the interior, every but is decorated with painstaking care—the walls, the ceiling and even the inevitable pile of trunks containing dowry are painted brightly. 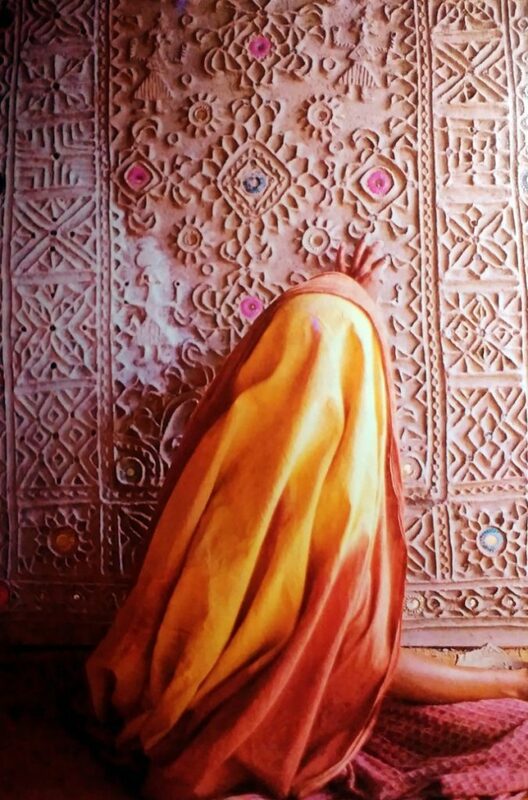 A pile of quilts handworked by the women folk are covered with an exquisitely embroidered dhrania. In the dim light of the hut, an array of brass water vessels gleam softly. There is no furniture save a carved wooden baby cradle and occasionally an almirah. While the men in Dhordo appeared to do very little throughout the day, their women worked from morning to night, tending their livestock, looking after their children and cooking. And when they were free of their chores they would gather in the courtyards to their bharat kaam or embroidery. 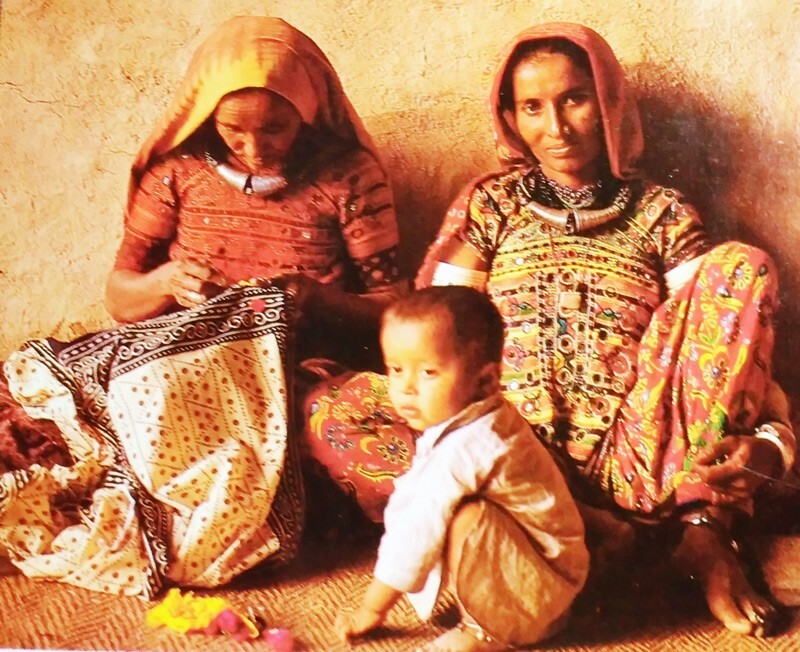 Each caste has its own style of embroidery—the Muthwa caste of Dhordo has a style of finely worked tiny stitches. 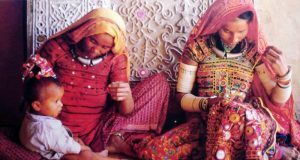 In a harsh land where there is little to celebrate the women of Kutch create a magical world of colour and celebrate everyday life. The inspiration for the colours they use is drawn from the majestic palette of the desert which surrounds them. The reds, oranges and blues are the fiery colours of the rising and setting sun. There is a scattering of greenery too in their landscape, as there is in their embroidery. Women exult in beauty and beautiful things and have an unerring eye for design. My modest jewellery was examined lovingly with childlike delight and my embarrasingly ugly travelling clothes were regarded with a mixture of pity and scorn. 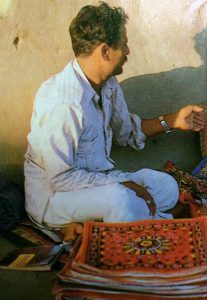 They drew patterns with their fingers over my kurta, visualising the sort of embroidery they would have worked on it. After being taken on a tour of the village Gulbeg received word from the driver of the milk van that there had been an accident in a neighbouring village. The doctor was called and observing all that was noble in his profession, picked up a battered briefcase, and inviting me to accompany him, we set off in the family jeep. On the way I expressed my surprise at meeting a doctor in such a remote area as this, and in a few minutes, it became clear that here was no doctor, but a genuine “quack” who had worked for a few months as assistant to a compounder at Bhuj. Upon reaching Bitara, a Jat village, a profusely bleeding man was produced and the doctor’s eyes lit up with glee. At last, here was a real patient on which to practise his skills!! In the meantime, I set off to look around the village. The women have a distinctive dress: black, full skirted ankle length jabba, where the only splash of colour is a huge yoke. 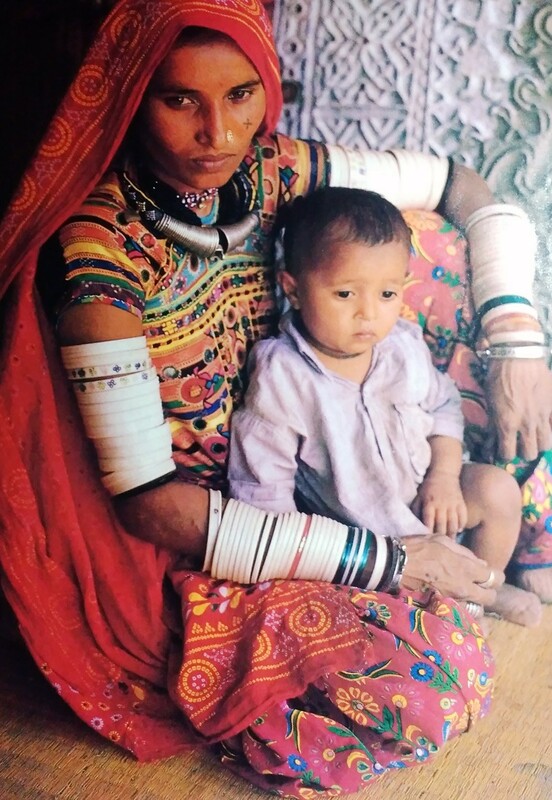 Jat embroidery is arguably the finest in Kutch. Certainly it is the most time consuming—the background cloth is not visible after layers of minute stitches have covered the entire area in geometric patterns. In spite of the use of mirror work and bright colours, red and orange being favourites, the effect is dramatically different from any other embroidery in Kutch. As if to emphasize the difference, their jewellery is dissimilar as well. A few silver bracelets instead of the more common ivory or bone, and an enormous gold nose ring. My next stop was Hodka, which looked as deserted as every other village did from the outside. Inside, however, was swirling sensuous colour. Almost all the women wore subtle, subdued shades: deep maroons and earth browns and because of the spectacular embroidery of Hodka, the effect was dazzling. 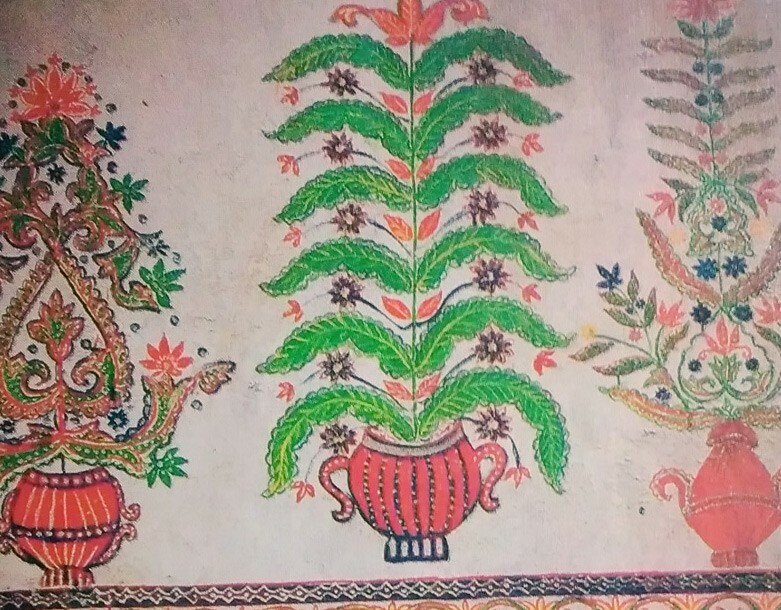 The village was spotlessly clean and the houses were decorated with mud work for which this community is famed. 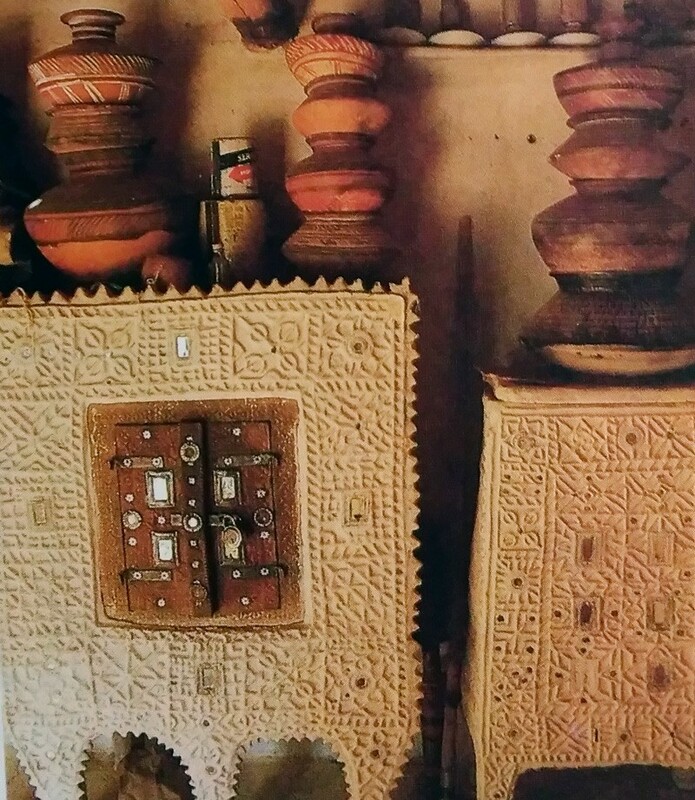 The mud work is bas relief in clay and cowdung set with tiny twinkling mirrors and given a white wash. The effect is cool and soothing to the eye. And like the embroidery that they do, no pattern is sketched out beforehand. 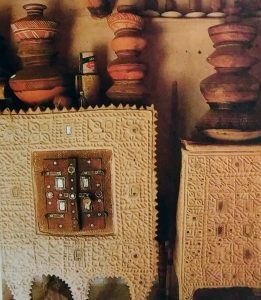 Mud work is used to adorn the quaint cupboards in each hut, besides storage grains and display shelves. 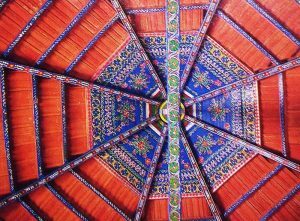 Like embroidery, it is done only by women and it typifies the use to which ordinary materials are put to create an object of beauty. Quilting is another example. In a land of scarcity, nothing ever goes to waste. Strips of unused cloth, lengths of worn out fabric. from clothes—all are carefully collected until there is enough material for dextrous fingers to create what the mind’s eye has seen. There are several young girls in Hodka to be married within the year, and all were industriously embroidering the backless blouses they wear over skirts for their dowry. Each one emptied her dowry chest of all its treasures for me to admire—a profusion of rich warm colours, lovingly worked over with mirrors that any bride would be proud to carry to her new home. And at night, when the sky turned velvet black, fires were lit in the open air, the menfolk huddled around, wrapped in their rough, home-woven shawls and began to sing bhajans. 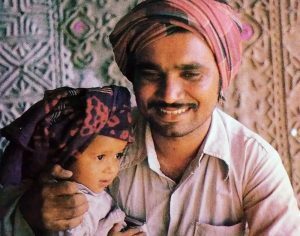 It is a long time since that trip to Kutch but whenever I recall the stillness of the desert night, the cold crispness of the air, those untrained yet powerful voices, and those haunting melodies, I resolve that some day I’ll go back. Back to those innocent people who had so little to give, but gave so unstintingly.